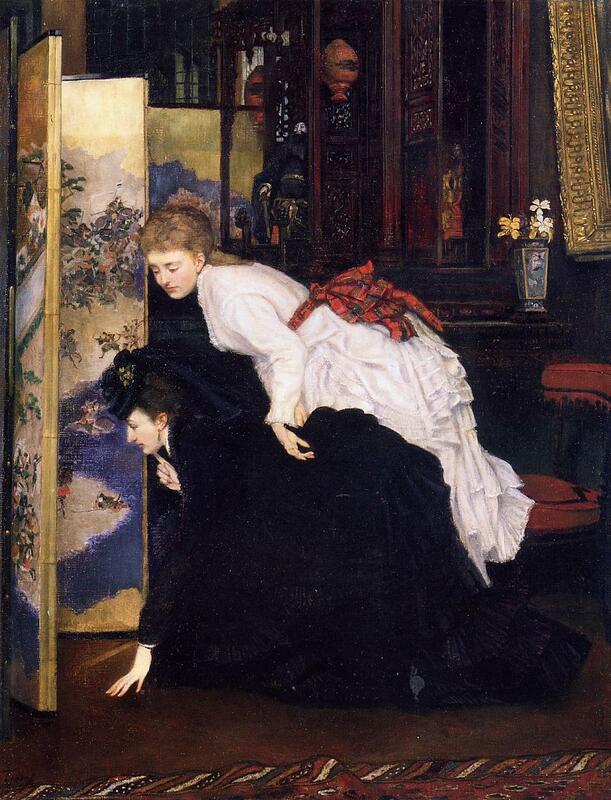 James Tissot’s studio, a showcase for his renowned collection of Japanese art, became a landmark to see when touring Paris – and, for Tissot, it was a brilliant marketing tool to attract commissions. Within about five years, his collection of Japanese art and objets had grown to include a model of a Japanese ship, a Chinese shrine and hardwood table, and a Japanese black lacquered household altar, along with dozens of embroidered silk kimonos, Japanese dolls, folding screens and porcelains. Tissot’s Parisian villa provided the lavish interiors filled with Oriental carpets, furniture, fabrics, carvings, vases and wall hangings that he used in his paintings. In 1869, he arranged these exotic items into elegant compositions in three similar paintings featuring young women looking at Japanese objects. 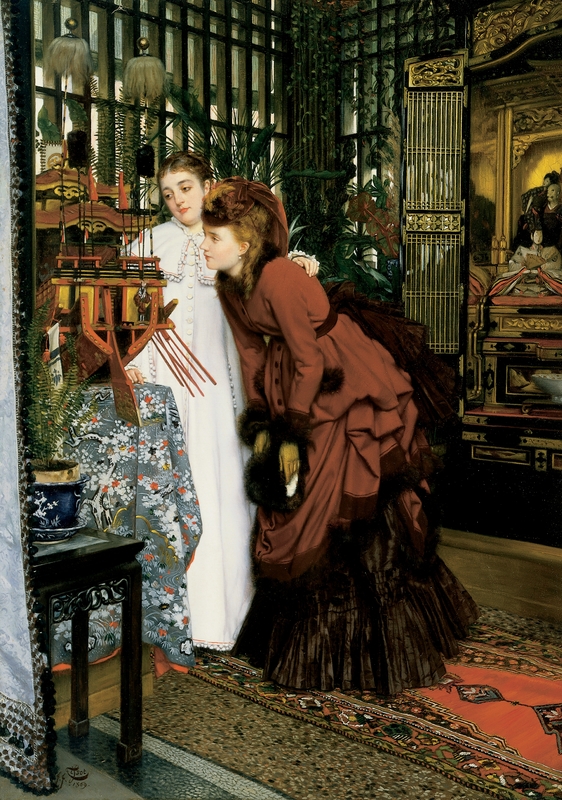 Tissot employed japonisme more sensationally (and with more financial success) than anyone at that time except for Alfred Stevens. 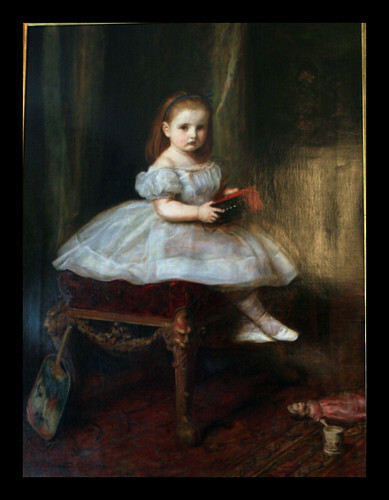 In London, where Jimmy Whistler had been exploring japonisme in his work for the past four years without much praise, Millais only added a Japanese fan near the bottom of his portrait of little Miss Davidson (1865). As for Manet and Degas at this time, while they were absorbing new concepts of color, shading, perspective and composition from Japanese prints, they merely added a touch of japonisme in their work. 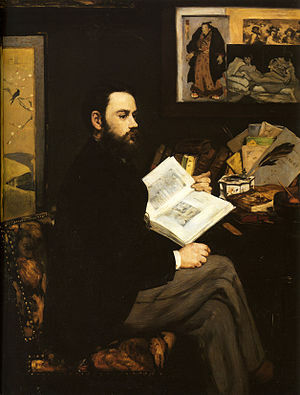 Manet added a Japanese screen, as well as a Japanese print in his 1868 portrait of his defender, the writer Émile Zola. Degas included a Japanese screen in the background of his 1867 portrait of Tissot, and his portrait of Madame Camus, (1869-70, Chester Dale Collection, National Gallery of Art, Washington, D.C.) depicts her holding a fan. 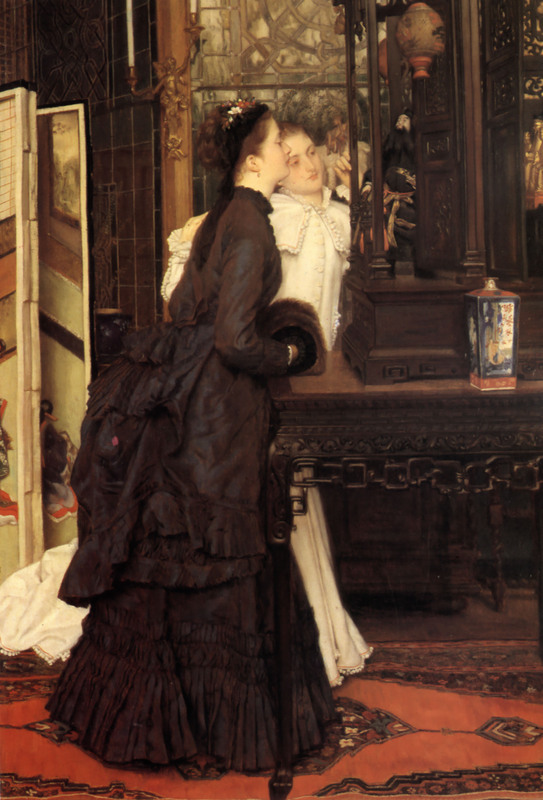 Tissot continued to surround himself with Japanese art. As it would turn out, he had very little time left to enjoy it. This entry was posted in Art blog, Art History, Impressionists and tagged Alfred Stevens, Édouard Manet, Edgar Degas, J.E. 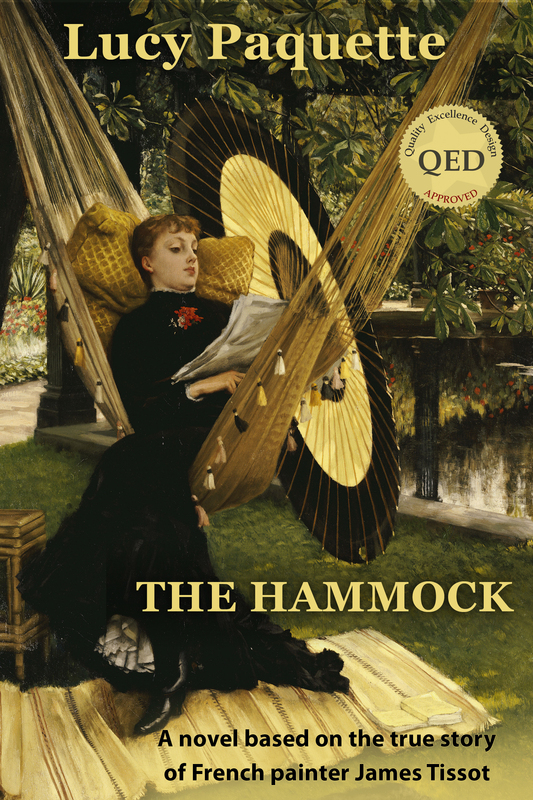 Millais, James Tissot, Young women looking at Japanese articles on January 3, 2013 by Lucy Paquette, author of The Hammock: A novel based on the true story of French painter James Tissot.